The modern wallpaper covering a wall in the bar can’t hide that this building is much a part of Lanjarón’s history as its spa. 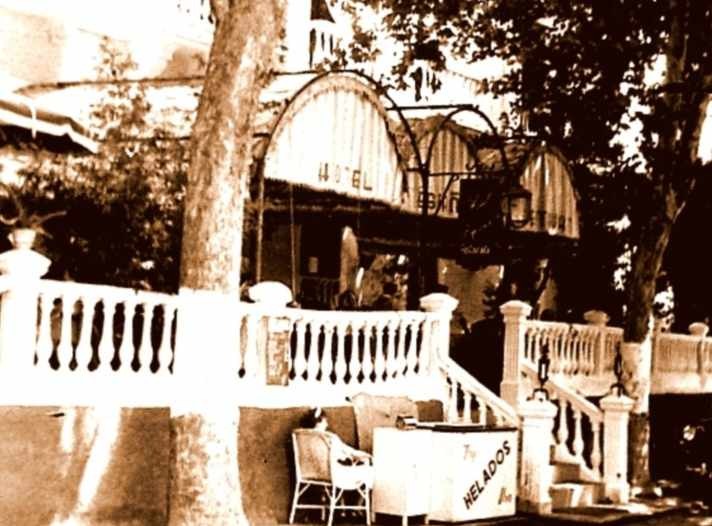 As you step inside, a message greets you: ‘Desde 1917 en los muros del Hotel España se ha ido escribiendo una hermosa novela’ – roughly: since 1917 (on) the walls of Hotel Spain have been writing a beautiful story. These aren’t empty words; poet Federico García Lorca spent many summers here with his family, visited by one of Spain’s great composers, Manuel de Falla (they also visited Órgiva together). And, over the years, like a jigsaw of slowly fading framed time capsules, the walls have become adorned with poems, letters, music manuscripts and photographs. You can even ask for a ‘route of memories’ guide which explains what the items are. The place is full of exquisite furniture looking like it hasn’t been moved in a century. 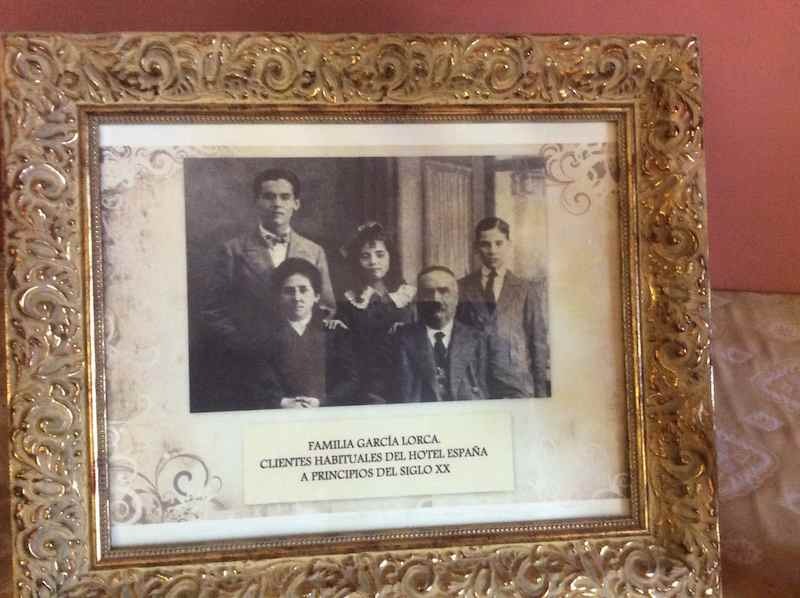 Lorca wrote part of La Casada Infiel (The unfaithful wife) here. There’s also an old piano that Manuel de Falla, and Lorca, played. It’s in tune too as M found out, lifting the lid to play a chord in D minor, the saddest of all keys. All this gawping and squinting of eyes leads to an appetite, and Hotel España is a fine spot to enjoy a drink and tapa; we’ve ended up here many times. The outside terrace by the entrance runs alongside the street. 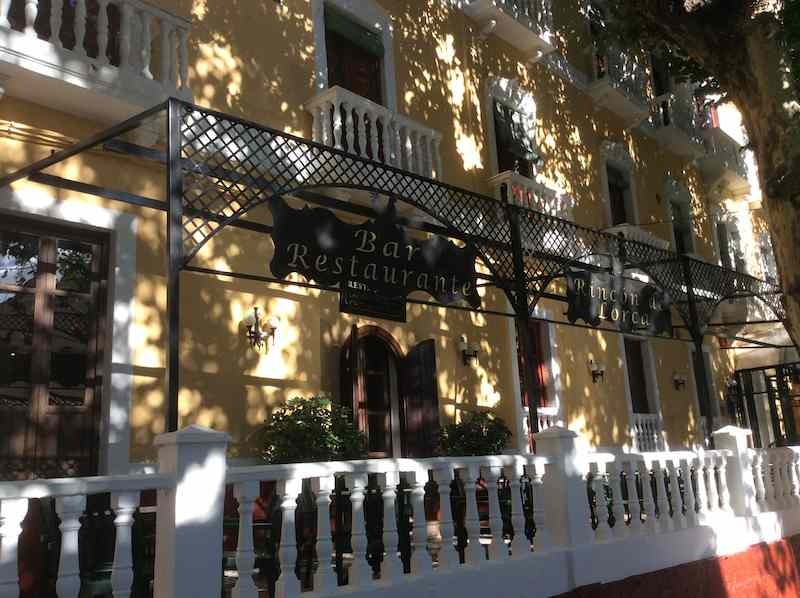 The restaurant – Rincón de Lorca de Lanjarón – is pretty good too. We enjoyed the €10 a head menu del día, served by friendly Paco. 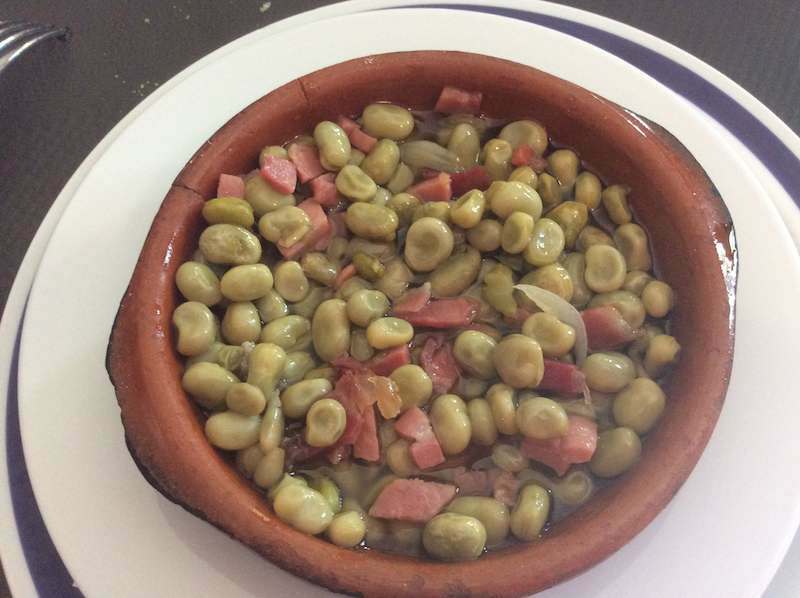 For starters we had cazuela de fideos (baked pasta and fish stew) and habitas con jamón (baby broad beans and ham), a perhaps too-oily herby, garlic chicken (but it was olive oil after all) and calamares. Homemade desserts were natillas (custard) and a gorgeous, rich chocolate mousse. Simple but well-cooked food and amazing value. In fact, the main menu is very well-priced and fish dishes, for example, are around €9. One of Spain’s most famous bullfighters, Manolete, also stayed here and it was in the reception, in August 1947, that his long-term partner, Antonia Lupe Sino, found out about his death following a bullfight in Linares (here’s a fabulous post about Manolete on the ‘Before Their Time’ blog). The sombre, dark interior would be a fitting place to exhibit the sangre de toro. Hotel España – Avda. de la Alpujarra, 42, Lanjarón.